During the past few months, we have been spending our time learning our style and rhythm of school. Discovering who I am as a teacher to my kids, and how my kids learn the best has been intriguing as well as challenging. I spent a decade learning how to know my 6th grade students, but we didn’t have to deal with whether they focused better in the morning, afternoon, or evening. Or whether they needed playtime in between each activity or if they could do several activities all together. The day was scheduled and I had my students for an hour. I am glad to announce that we are learning! We are learning both content and more about who we are as people and learners. In that light, I am not sure where this blog is headed, or what it will morph into; however, for the time being, my goal is to post fun and valuable lessons we have completed, or are working on. I am thinking of it almost as a journal, something we can look back on to track our journey together. I invite you to come along with us. Currently we are taking a trip through the Solar System using Lapbooking through the Solar System by Paige Hudson. It is a great resource. I grabbed it as a freebie, but I believe it is worth the $4.50. It has provided a great structure for our space exploration. 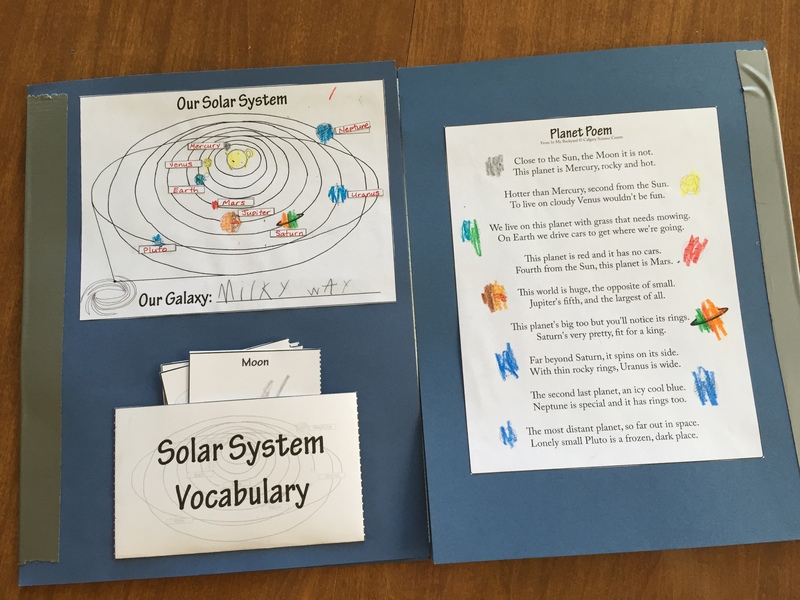 We spend two to three days learning about each planet and complete a fun activity to go with it. Once you get into the planet portion of the lapbook, it tends to become a little repetitive. So, I have been making sure to add one or two of my own (or found) activities to beef up the fun factor for a K-1st grader. The information for this lapbook comes from whatever books you may have on hand or can find at the library. So before starting, I would recommend finding two or three books to cover the solar system and/or each planet. The lapbook gives suggestions for several books. Since I didn’t have the books recommended, nor did my public library, I used what I (and a friend) had on hand: The Solar System by Rosalind Mist, and planets by Gail Tuchman. Today, we finished up the section on the moon. The lapbook has a Phases of the Moon Diary page where you observe the moon for 27 nights and record a picture of the moon as well as the phase that it is in that night. 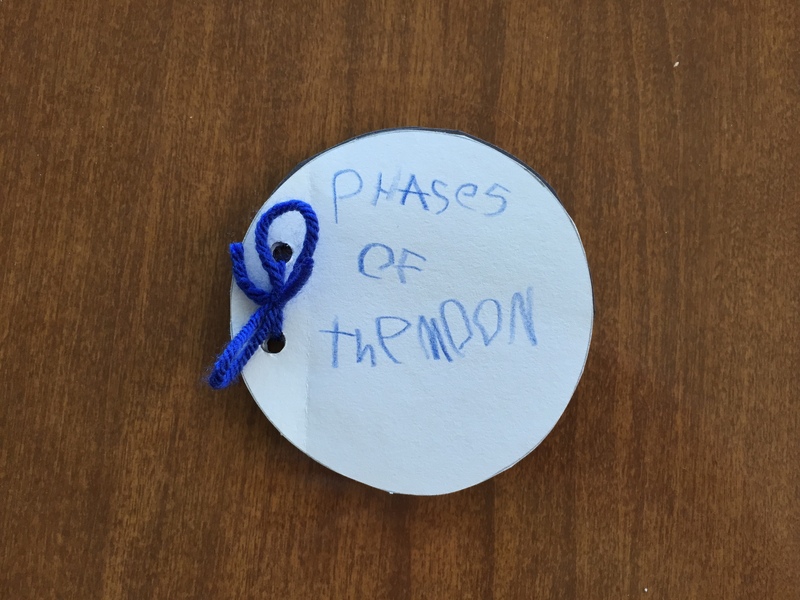 I found this really cute Phases of the Moon book over at teachinginbroncocountry.blogspot.com. Mason had a lot of fun putting it together. Tonight will be our first night to observe the moon. So, we will head outside with binoculars in hand and Mason will be able to refer to his Phases of the Moon book and fill in his moon diary. He is very excited and I love that.